On a post Christmas trip to my local bead supplier I found these pearls. Imagine my delight and wonder. I've never before seen such large coin pearls ~~ they're almost as large as quarters. The glossy baroque pearls are so beautiful in their natural off-white state that I simply wired with sterling silver filled wire and hung from sterling silver filled leverback style hooks. Let the pearls speak for themselves. Coin pearls are 20mm in diameter (huge for pearls) and from top the leverbacks fall 1.75 inches. Each pair will look very similar to these images, but they are baroque with natural markings. Make a statement!!! Dress up or down. I took a field trip to my local supplier this week and couldn't resist these gorgeous Blue Sodalite stones. I knew they'd make the perfect pendant for my boho style chains with chunky gemstones. Love. I wire wrapped the sodalite stone in the popular messy style in antiqued silver wire. Necklace measures 30 inches to the pendant. Chain is antiqued silver plated soldered link brass chain. Pendant falls 1.75 inches from the chain. Each stone is similar but a little different with beautiful natural striations of blue and white. I spent a little time running statistics on my Etsy site this morning to see which pieces were most "liked," purchased, etc. Thought you'd be interested in seeing the results. This seems to be one of the "in" colors right now. I just returned from the department store and can attest to these colors~~they're definitely in. These are amethyst dyed jade cylindrical beads which I strung on high quality beading multi-filiament wire with antiqued silver beads, a sparkly Swarovski crystal, and finished with a sturdy antiqued silver oversized toggle clasp (about the size of a quarter). Bracelet measures a full 9 inches but due to the size of the stones fits my smaller than average wrist a bit loose. To complete the set, I wired some of the same stones in antiqued brushed wire and hung from antiqued silver 1.5" kidney style wires. Beautiful. Adorable. I took these darling silver beads, added Swarovski crystals and hung from long antiqued silver kidney wires. Antiqued silver plated daisies are 7mm in diameter. Swarovski crystals are 4mm in size. Choose your preferred earwire style at checkout, too. Glossy as freshly pulled toffee candy, Tawny Toffee will want to make you break out a silver mallet and go to town! Toffee is made from caramelized sugar or molasses and butter. Mmm, I like it already. You cook the stuffing out of it then heat to a range which will determine if your toffee is soft and sticky or hard and brittle. I like it anyway it comes. All Magpies are made by me in my home studio. All metals used are nickle and lead free. The necklace as shown measures 34.5 inches long. I can shorten at your request. Pearls are glossy genuine freshwater cultured pearls and Tiger's Eye. Wire is non-tarnishing Vintaj brass. Crystals are genuine Swarovski. Clasp is antiqued brass. Eggplant purple, rich and dark, these Swarovski pearls are sure to make a statement swinging from your ears. All Magpies come charmingly gift wrapped and ready for giving. Earring pearls are 12mm Swarovski pearls. Wire is brass. Choose your earwire preference (all brass) at checkout. I have french hooks, 1.5" kidney wires and 2" kidney wires (shown), all in antiqued genuine brass. See/buy on Etsy here. If they capture your fancy I only have pearls to make two pair. Glossy simple black onyx donuts are hung from gunmetal earwires of your choice. How can something so simple say so much?? Elegant. Donut measures 1/2 inch in diameter. From the 1.5" kidney wires they fall roughly 2.25 inches and from the leverback, 1.25 inches. I find so much comfort knowing that God redeems broken lives and creates beauty. Take the account of the prostitute, Rahab, for example. When the Israelites were attempting to conquer Jericho in the the Promised Land, the heroine was Rahab, who hid the Israelite spies and saved them from capture and certain death. When the city was overtaken, she let down a scarlet cord from her window and she and her entire family were saved. Imagine being saved from death by the courageous actions of your promiscuous daughter/sister/niece--the black sheep of the family--the one scorned, talked about, shunned in public circles. Yet God's Word demonstrates repeatedly that He sees our hearts, goes beyond the outward appearance, and Redeems. The Scarlet Cord, albeit more a dark burnt orange than true red, is a statement in Carnelian, Creamy Coin Pearls, Swarovski Crystal, and Vintage Bronze chain. To me it tells a story, a story of redemption and new beginnings. Bracelet is adjustable with several inches of antiqued bronze chain and fits up to 8 inches in length. Earrings fall 2.25". So many beautiful earrings, bracelets and necklaces ... you're find just the right gift. And I'll make custom adjustments on the spot. Gift wrapping, too. Magpie takes cash, checks and credit cards. 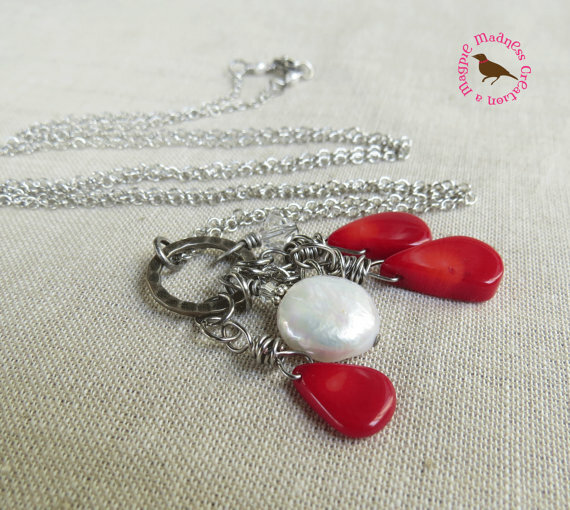 Gorgeous red coral teardrop beads, messy wire wrapped in Titanium colored wire and hung from surgical steel french hooks. Brighten ANY outfit. Shown here, hung from french hooks, but choose surgical steel leverback wires or antiqued silver kidney style wires at checkout if you prefer. See here or coordinating necklace here. Darling daisy stud earrings on surgical steel stud bases. Daisies measure 7mm in diameter. I found these palest of rose quartz faceted teardrop beads, wrapped in sterling silver filled wire, added in a wee Swarovski crystal and hung from sterling silver leverback earwires. These are a very pale pale rosy tone. Most feminine. From the top of the earwire they hang a little over 1.5 inches. See/buy on Etsy here. It's Christmas time and our hearts turn towards those we love and care for, warm cider, freshly baked cookies, and the true meaning of Christmas--Emmanuel, God with us. Gorgeous. 30 inches of chunky antiqued silver plated soldered link brass chain, antiqued silver plated copper wire wrapped beads~~two Amazonite teardrops, a large silvery freshwater baroque style coin pearl. 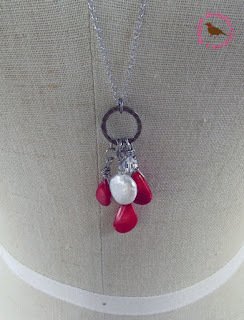 I threw in a sparkling Czech glass crystal and a Swarovski pearl side dangle for some extra pizzaz. Pendant falls 2.25 inches from the chain. Gray coin pearls are a smooth"baroque" style with natural formations. Amazonite beads are varied in natural color formations as well and will be similar and equally beautiful to what you see in these images. 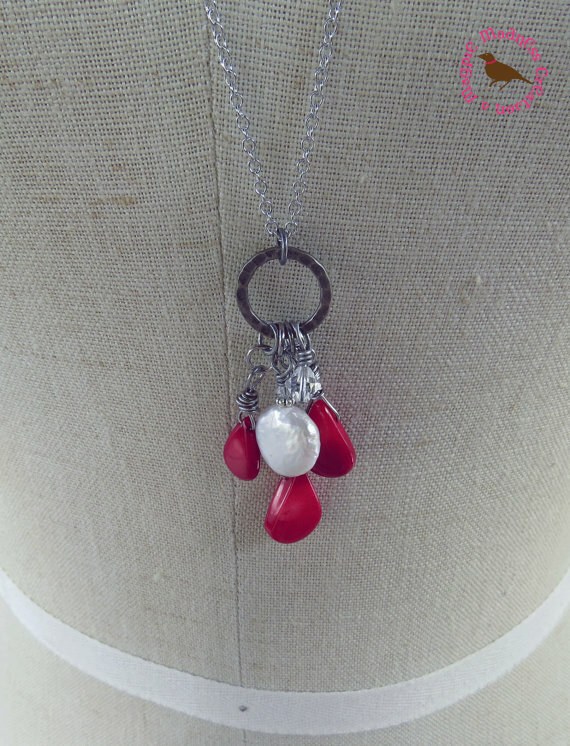 Lovely red coral teardrops coupled with a snow white coin pearl and a bit of Swarovski sparkle. Reminds me of one of my favorite fairy tales, Red Rose and Snow White. Lovely amethyst coin pearls, rich blue small freshwater pearls and Swarovski crystal--now that's a winning team. Bracelet is adjustable and can clasp as wide as 7.5 inches and as close as you prefer to wear it. I can add some extra chain if you need a few extra inches. Just msg me. Coin pearls measure 15mm in diameter. 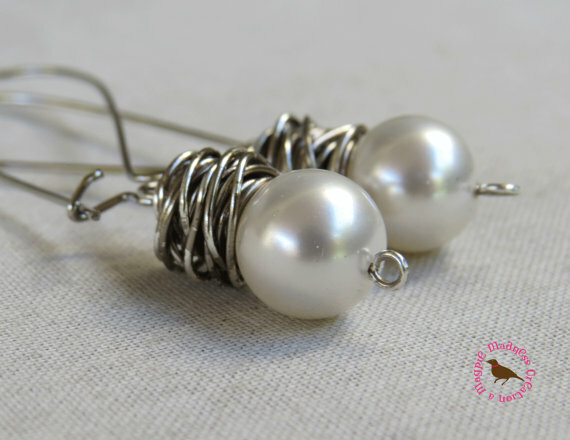 Earrings are coposed from the same lovely coin pearls and are shown here on 1.5 inch kidney wires. So pretty. The bracelet measures 7.5 inches and is adjustable. The extra chain will hang down as a dangle. I can definitely provide a longer chain at your request. Earrings measure 1.5 inch from kidney wire hooks. Please let me know at checkout if you'd rather have leverbacks. Stunning. Delightful neo victorian vintage style brass Y drop necklace. Delicate and feminine. Necklace shown measures 19 inches from the centerpiece to the brass trigger clasp. Composed of Preciosa Czech Fire Polished glass, Swarovski crystal, vintage bronze flower beads, and brass chain, it's a decidedly feminine adornment to grace your neck. I created two pair of earrings. The one's seen above (fall 1/2 inch from the earwires) can be added on to this purchase. Shown on leverbacks, you can note at checkout if you'd rather have french hooks. The chunkier pair are found here, https://www.etsy.com/listing/218030455/amethyst-leverback-earrings-amethyst?